Ornamental and Silver Smoke, Star of Night together for $20. Order our Holiday Twin Pack today! 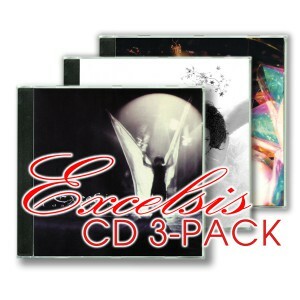 Excelsis 3-CD Pack ~ v.1, v.2 & v.3 | $23. 1995’s Excelsis v.1 ~ a dark noel has consistantly been one of Projekt’s most popular releases. The follow-up, 1999’s Excelsis v.2 ~ a winter’s song, quickly brought joy to many more fans of darkwave music. In 2001, we added the the not-available-in-stores Excelsis 3 ~ a prelude Maxi-CD to create a trilogy of dark holiday releases. The Excelsis Three Pack makes a great holiday gift for your friends, or even for yourself. Happy Holidays. Due to the weight of this Three Pack, it can not be shipped via first class mail. Balderas & Osborne: What Child Is This? Julia Kent (of Rasputina): What Child is This?